This Prochem Urine Neutraliser is ideal for commercial use where the regular neutralisation and deodorising of urine is important. This is an acidic deodorant that can be applied directly to surface areas to neutralise odour from urine deposits and prevent staining. Available in a 5 litre bottle that can be purchase as a single product or as a bulk buy option. The Prochem Stain Pro is a heavy duty water and solvent based alkaline protein spotter. This is a powerful formula that is effective against tough stains such as blood, vomit, ink and coffee. This is an easy to use product that leaves a fresh mint fragrance after use. The Prochem Stain Pro comes in a 5 litre bottle; it is available to buy as a single purchase or a bulk buy option. Prochem Solvall Spotter is a high performance volatile dry solvent for general spot cleaning of oil, grease, adhesives, tar, gum and oil based paints. Prochem Solvall Spotter is a ready to use formula making it easy to use. It can be bought as a bulk buy option or as a single purchase. This Prochem Contract Carpet Defoamer is ideal for controlling the build up of excessive foam in hot water extraction machine recovery tanks. This is an easy to use, concentrated silicone anti-foam agent that is ideal for those maintaining commercial properties. This product is available for bulk buying and for single purchases. Prochem Natural Carpet Cleaner concentrate with encapsulation technology and gentle pH, for cleaning most types of carpets and rugs. This easy to use product is ideal for commercial cleaning. It needs to be diluted, making the 5 litre bottle last a long time. It can be bought as a single purchase or as a bulk buy option. Odour Fresh Prochem is a high quality deodoriser that is ideal for professional cleaners. This is an easy to use formula that can be added to carpets, fabrics or general cleaning solution. The formula needs to be diluted making a 5 litre bottle last a long time. This product is ideal for commercial use. It can be bought as a single purchase or a bulk buy option. The Prochem Fresh Breeze Odour Neutraliser can be diluted with water and applied by sprayer or added to cleaning solutions. It is an environmentally friendly formula that is Biocide free with a safe odour absorber. The Prochem Fresh Breeze Odour Neutraliser is available in a 5 litre bottle that can be purchase as an individual product or as a bulk buy option. Please be aware that for customer satisfaction, this machine will be delivered on a European pallet (80x120cm). This is carpet cleaner sits in the middle of the three SteemPro machines, it benefits from the compact size of the SX200 and the extra motor and power of the SX2700 making it a very powerful machine. The Prochem SX2100 is built to a very high standard, using high quality parts, featuring a tuff scuff-resistant body and solution tanks making this a very durable machine. This machine is one of the latest and most advanced carpet cleaners in Prochem’s market leading range of portable soil extractors. Ideal for single operator use it is a very high-powered carpet extractor incorporating two powerful 3 stage vacuums and a 150psi pump system with an internal whisper quiet silencer making it one of the most powerful yet quiet portable extractors in the world. 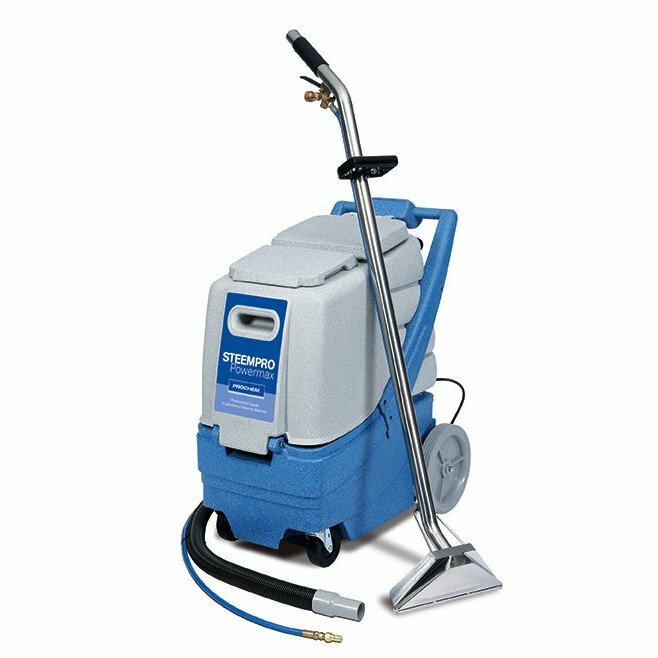 The SX2100 along with the other Prochem SteemPro carpet cleaning machines is one of the most popular machines in the UK and are even used by royal appointment to clean carpets and upholstery for the royal family. If you are just starting out as a carpet cleaner or are experienced in the industry we would highly recommend using one of these machines. The SX2100 is very easy to use, and despite its large capacity will comfortably fit in a small van or most large cars. Due to its large clean water and recovery tanks it allows you to clean a very large area without having to change or empty water too often saving you time and money. It comes with a 7.6 meter (25ft) hose so you don’t have to spend time moving the machine around, and in some cases you could even leave the machine outside if needed whist cleaning inside. With the addition of one of Prochem’s hand tools you can easily reach up or down stair cases leaving no step uncleaned. This machine comes with a free training course with Prochem professionals. We highly recommend going on one off these courses where you will be tout about carpet cleaning best practices by industry experts. The course includes information on what type of chemical to use on what type of fabric or carpet and how to get the best results when confronted by difficult or unusual stains that most people just don’t know how to deal with. Each machine comes complete with hose and Glidemaster stainless steel wand. All you need is chemical and you are ready to go. Go on the free training course, it is worth it. Never leave your machine in a van or outside when there is risk of frost. There are brass components in the solution system of the machine that will break or become damaged if the residual water in the system freezes. Keep your machine clean. Clean your filters and your tanks when you have finished using your machine and it will perform better for longer. Use defoamer. You will damage your vacuum motors if you don’t use defoamer and it will void your warranty. Like any moving parts on any machine they will need maintenance, get your pump serviced every 6-12 months to avoid unexpected down time. Use Prochem chemical. It is very good quality and you know you will get the best results. Tank/Body of machine: 2 years. At Janitorial Direct we have some of the most highly trained Prochem engineers in the country, all of which have completed the highest distributor engineer training coerces. We are very proud of our after sale support with customers using us time and time again for this reason. All leasing payments are 100% tax allowable. Every payment that you make on a leasing agreement can be used to reduce their Corporation Tax bill. Leasing allows you to purchase equipment which you need, rather than the equipment you can afford. Let the machine pay for itself. The equipment that is being leased is the only security that is generally necessary. No property is used as security, however, occasionally the finance company may need Directors Guarantees for some limited companies. Any lease agreement is based on the list price of the purchased product. All quotes are subject to status. Written details available on request. Although the use of a recognised Defoamer product is mentioned in all the service manuals issued with new machines the end user will hardly ever read this part and therefore will not use the product. The emphasis placed on a recognised Defoamer product cannot be stressed enough. Use of Defoamer in the recovery tank of a machine will, in most cases prevent excess water damage to vacuum motors due to dirty water ingestion. This is caused by the fact that foam is lighter than water and will not close the vacuum shut off ball cage assembly. This, in turn will lead to the foam being ingested into the vacuum motors. In addition to this, it is also important to your keep clean water reservoir separate from waste water and to this end we also recommend the use of different coloured buckets such as the red and white Prochem CN3503 buckets shown at the bottom of the page, the red being used solely for waste water and the white just for clean. Any vacuum motor returned for repair or warranty claim that shows any sign of dirty water ingestion will not be replaced since the Terms & Conditions of Warranty have not been adhered to. Add 20ml of Prochem S760 Liquid Defoamer concentrate per 10 litres of recovery tank capacity (1-500). Dilute the required amount of concentrate in a small amount of water and feed this solution into the vacuum hose, with the machine switched on and add defoamer solution directly to the machine recovery tank. Do not add Defoamer to the cleaning solution. For excessive foam, increase the amount of S760 required. Q. Can the Prochem Steempro Powermax (SX2100) Carpet and Upholstery Cleaner be laid on its side when transporting it? A. No, we don't recommend that you transport this machine on its side as water residue in the pump, hoses and machine body might get somewhere where water is not meant to be and damage the machines motor.